As already mentioned in the first part, this is a blog and not an academic piece of writing, we are not looking to provide scientific facts and figures; although we may use a bit of basic number crunching to illustrate a point or two. We would advise you to explore this topic more in depth as it plays a massive role in crowd management. In our previous visit to looking at the design and efficiency of queue management systems we looked at a Green field site; where we had as much space (well nearly) as needed. But what happens when we don’t have all the space in the world and a lot of restrictions. 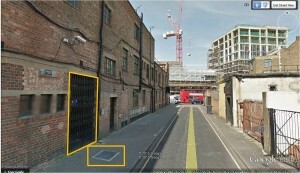 In this case we are going to look at venues in built up urban areas. The venues in this case are live music venues. 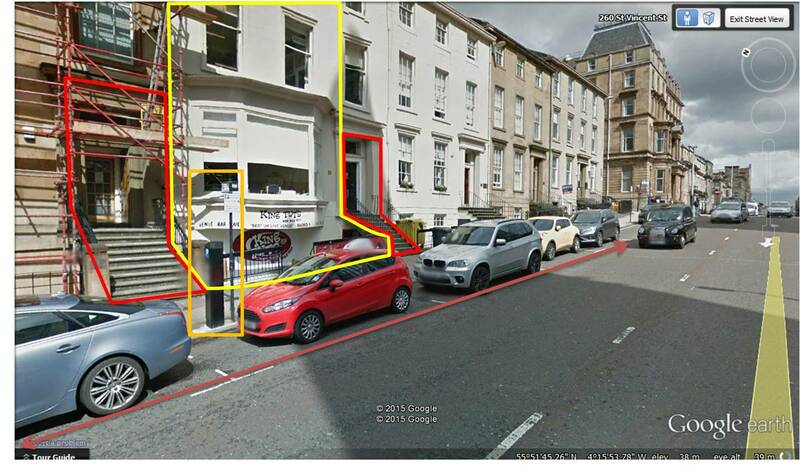 The reasoning behind this is because of the entertainment licence and duty of care that is attached to these venues. When you go about your daily life in a city we see queues everywhere; bus stops, cash machines, Greggs the bakers and even coffee shops. Unlike all these places though, music venues are responsible for making sure that if they have a queue it is kept in an orderly and safe manner. If you do not understanding what this means, then maybe you should read up on the guidance and legislation (it is kind of important). Music venues operate year round across the country. From small clubs to mega size arenas, they keep bands touring up and down the country and drawing crowds to them. For the benefit of this blog we are going to simplify the process. We will choose three venues- small club, medium size and large venue. We will not be looking at arena venues in this blog. There are a couple of reasons for this. Arenas site on a site where they own the surrounding area and let’s be honest; they should have been designed and constructed with a specification for a queue management system. With this in mind, the majority of queuing problems have already been solved at the planning stage. 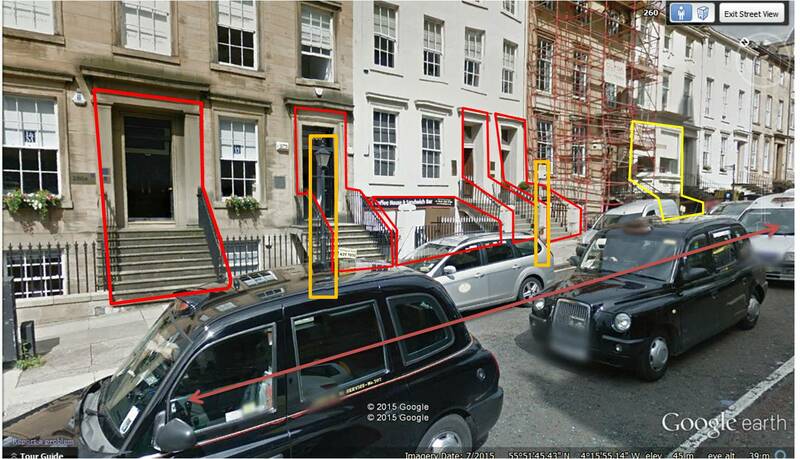 We want to look at venues that have their front doors on the street and customers have to queue on the public footpaths. 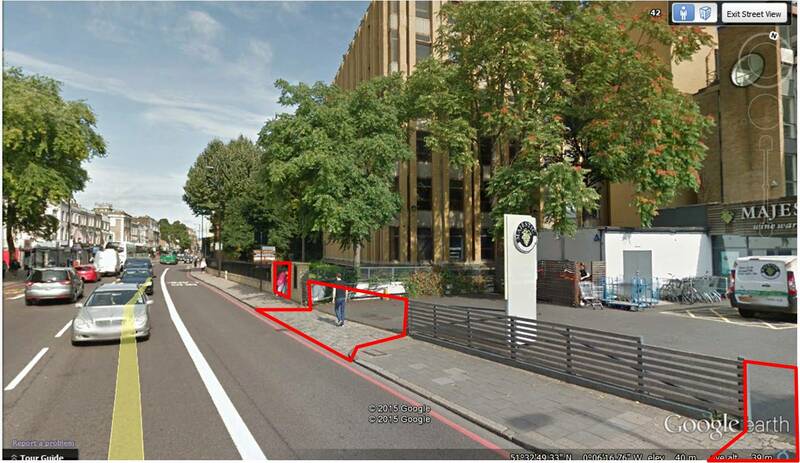 We are also going to look at venues that use one entrance point, be that one door to multiple doors and the queue leads to this point. When we look at many of our traditional theatres across the country, they were designed to use multiple entrances, so spreading any potential queue across several entrances (Looking into the Royal Albert Hall for an example of this). We are not here to suggest a solution for the venues we are looking at, it is the thought we put behind it and the process we go through to come up with a solution. 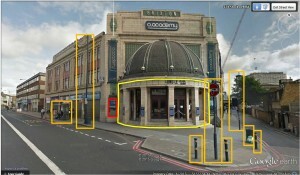 All venues have their entrances on the street of their cities and all are popular music venues showing a variety of genre and audience profiles. We should also point out that this blogger has no links to any of these venues, the crowd management suppliers they use or the plans they have in place. We are looking at these venues as a blank canvas, to see what problems we could have and if there are any solutions that can be implemented. We should really look at how people queue, if we are to understand how to manage queues. It is something we do in everyday life, normally in shops, banks and for transportation. From a very young age we are bought up in a way that allows us to understand that when waiting to either enter somewhere or be served, we stand behind the person in front of us. If we are by ourselves we will fall in behind the one in front; so if everyone is by themselves we end up with a large single file. If we are with someone else, we would normally stand next to one another. This allows for a more convenient conversation to take place, as this is how we present ourselves when walking forward. If we are arriving in larger groups, we start to fall in behind one another. This keeps the group together and allows us to turn around to talk into the group rather than the more difficult option of passing the chat up the line. In this manner, we as queuing customers dictate the width of the line if there is no management in place. If we are in the middle of nowhere, we will form a meandering queue with no real guidance or reason. If we put a line of fence there, then we would start to form a straight line along this barrier. This relates to the urban environment as well, although in cities fence lines can be replaced with walls, hedges, handrails and painted lines on the ground. Do we just leave the customers outside till it is time to open doors? Or, do we monitor what they are doing? Who controls where they have to queue or is it a hit in miss if it goes the way we want it to? Where are the main transport hubs – train stations, underground and bus stops. For smaller venues, some of this might not impact on them, but they should always be considered. The reason we look at all of these subjects, is because in some way they can have an influence on your customers, how you manage a queue and if you are even going to have a queue. With this we now know how many people can fit in the venue and worse case is they are all queuing outside before they are allowed entry. So, we start looking at our options of where to queue customers. With a bit of study, we have presented 2 solutions. With these in mind we carried out an assessment of available space. 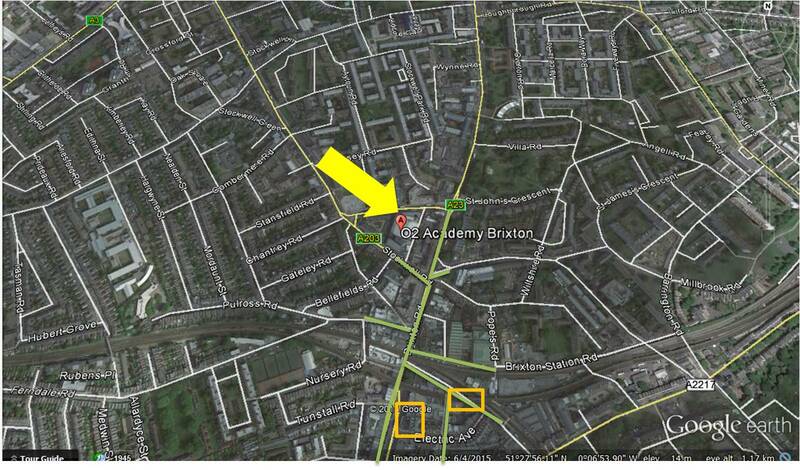 We will follow the Event safety Guide density level of 2 persons per square meter. Although most people will queue up to 4 persons per square meter, this is a smaller and more relaxed venue and as such customers will be more relaxed when queuing. As we pointed out in the first part of this blog, we generally will stand 2 abreast if standing in a queue and larger groups will fall in behind. 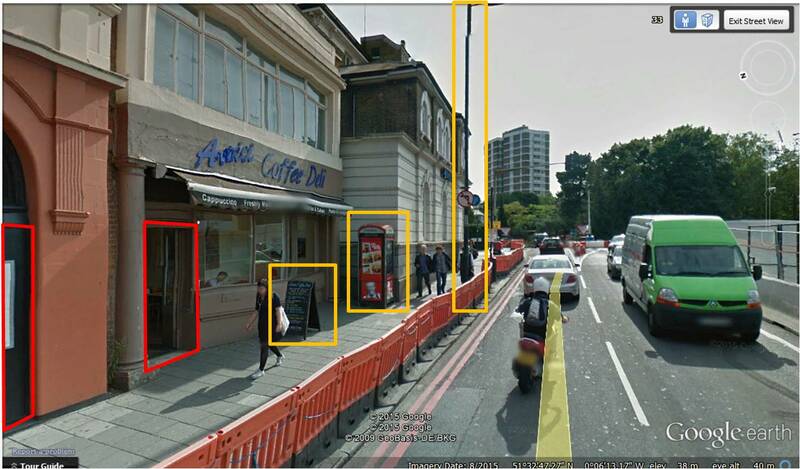 2 abreast will allow 2 persons to stand next to one another and we only take up 1 meters width of the footpath. 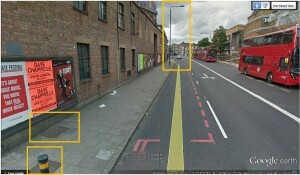 This leaves 2 meters of width for the general public to pass by the queue without interacting. = 152 persons can queue in the space. = 142 persons can queue in this space. So both options are short on space if we go with either option. Provided with this information we know that there is going to have to be some form of human interaction with the customers that are queuing. We can initially monitor early arrivals and when then when the queue is getting to a sizable length, we can ask customers to compress the queue and move closer together. We know that we can safely double the persons per square meter to 4ppm2. This provides us with Option 1 queuing 304 persons and Option 2 queuing 284 persons (slightly short of what would be the ideal option). 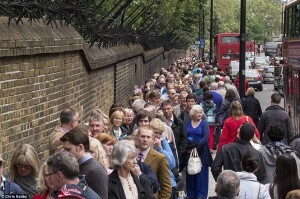 With a bit of basic maths we now know how many we can queue and can reassure ourselves that we can form queues outside the venue. What do we want to look at next? How about what is outside the venue. 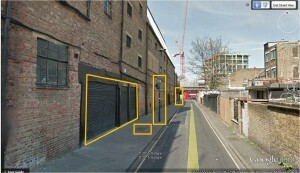 The following images show the outside of the venue on a normal day and can guide us in the correct direction of what we need to think about through the process. 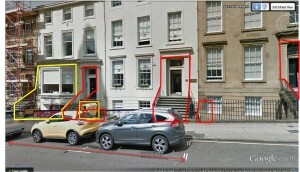 In these images you will notice lots of colourful lines have been added. These are points that we would consider looking at during the assessment. Red, are highest risk to the queuing system; Amber, lower risk but can impact on the queue. 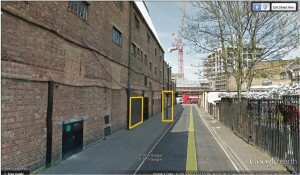 Yellow indicates the entrance to the venue. Lots of entrances to the buildings next to the one we are looking at. This is doors, staircases all leading to occupied premises that we are potentially looking to queue customers in front of their door. This is not going to build the best of relations with the neighbours. Is there any way around this problem? 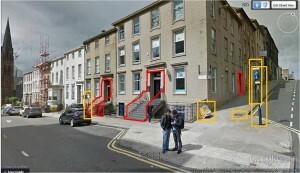 If we look at the buildings more closely they would appear to be places of business – offices and shops. 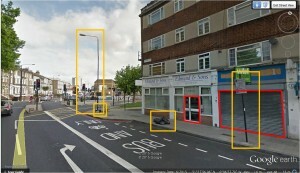 The building also seems to be well maintained and of a high standard suggesting affluent businesses. A quick Google search will allow us to see that this would be the case. This also provides us with a potential timeline to work to. A high percentage of offices and shops operate between the hours of 0800 – 1800. Most venues open about 1800/1900 in the UK. This cuts back the length of time that we would have to manage the queue for our neighbours. Building a good relationship with the neighbours will assist in reassuring them that we would manage any potential queues and keep the entrance to their offices/shops clear. 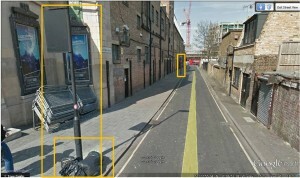 We would have to consider with offices/shops on either side of the venue, there is the potential of rubbish collection. 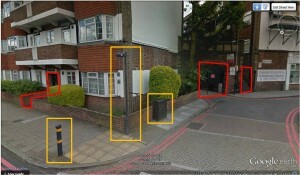 If the rubbish is not collected from the rear of the premises, then rubbish will be collected from the street. How this is deposited for collection would have to be observed, we can observe one large movable bin, but no others; this suggests disposable refuse sacks being used. Either option will impact on out queuing system. Deposits on the pathway will restrict the width on the path in some way and lessen the space for the general public to use when we have a queue. By assisting our neighbours with good housekeeping during the period of queuing we can ensure efficient use of the space available. There are parking bays outside the venue, with parking meters. 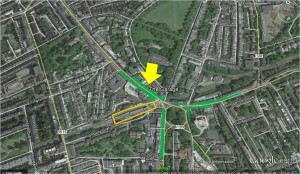 This would suggest that there will be a turnover of vehicles in the area. A line of parked cars does protect the queue from faster moving traffic though, reducing the potential of a vehicle mounting the pavement. There is also a pedestrian crossing close to the venue, so we know that if they chose to do so our customers can cross the road safely. 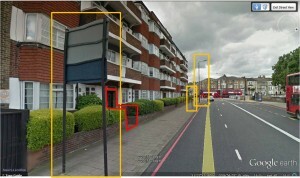 Additional street furniture can be observes, sign posts, signal box’s, street lighting, grit box’s and the parking meters. 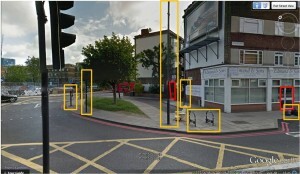 All of this restricts space on a pavement and becomes on obstacle that pedestrians have to navigate. 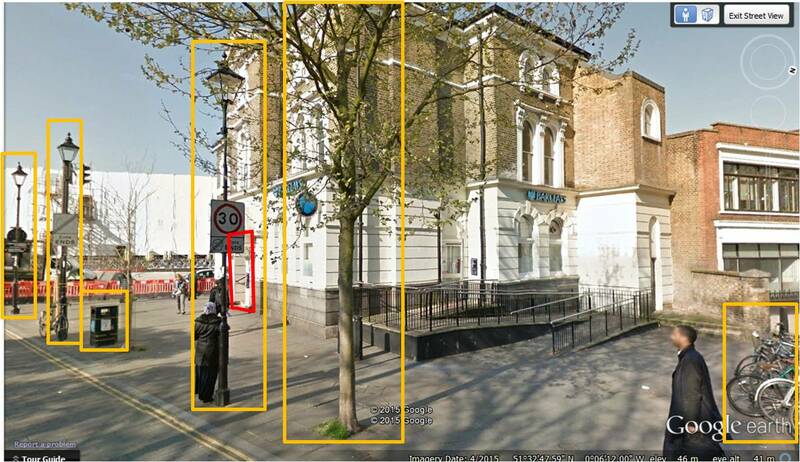 We should ensure that no street furniture impedes the route of our queue or through the placement of our queue should pedestrians have their passage restricted. The public pathway appears to slope from East to West; with West being the higher end. This may be a personal preference; although it is the case for the majority of people, I always like to go downhill if I have an option. If we look at the greater area of the city we will see that there is a higher percentage of bars, eateries and transport hums to East and the North. This could suggest by queuing up the slop to the East we will catch the majority of our customers. 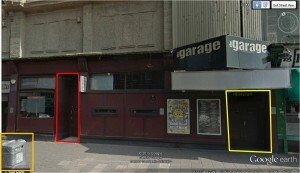 Although this popular venue has a smaller capacity than what its reputation might suggest, we can see that there is a potential for the customers to impact on the surrounding area. With this in mind a well thought out management plan of the exterior of the venue and queue management would be of benefit. With this we now know how many people can fit in the venue and worse case is they are all queuing outside before they are allowed entry. So, we start looking at our options of where to queue customers. With a bit of study, we have come up with 2 solutions and a bit of thinking out the box. We see that we have two possible solutions and we have chosen a preferred option (Green) and the less favourable second option. 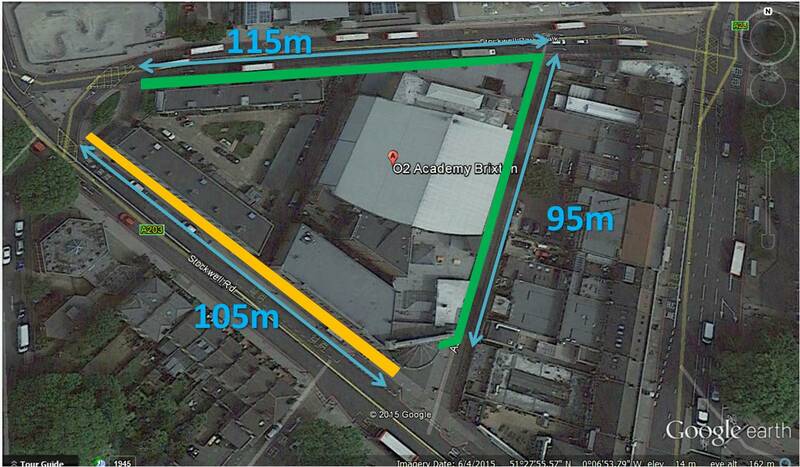 We will be applying the same rules as the small venue; no blocking the pathway and no crossing roads. = 144 persons can queue in the space. = 80 persons can queue in this space. So both options are short on space if we go with either option. Provided with this information we know that there is going to have to be human interaction with the customers that are queuing. We can initially monitor early arrivals and when the queue is getting to a sizable length, we can ask customers to compress the queue and move closer together. We know that we can safely double the persons per square meter to 4ppm2. This provides us with Option 1 queuing 288 persons and Option 2 queuing 160 persons . 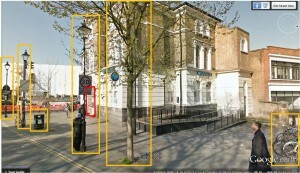 It could be suggested that queuing in this area is not desirable, but is achievable. Although we have calculated to the rear of the venue, the street continues further along behind the supermarket and beyond. This will allow the queue to continue. 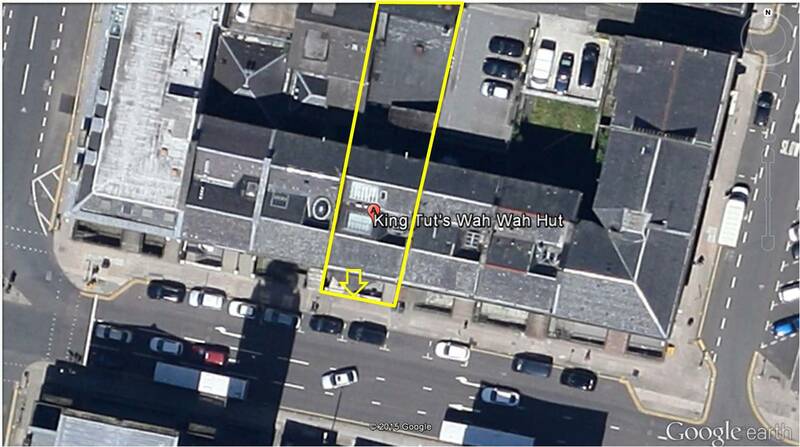 The reason we have indicated that this would not be desirable is due to the nature of the area. Behind the venue is a residential area with a park and children’s play areas. 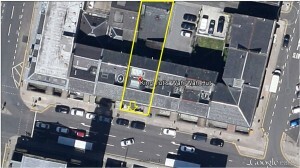 Even though the venue is in a highly populated area and situated within a main street, the rear is protected from the main street by the main street buildings and traffic restrictions. This means it will be a lot quieter and see less foot fall than the main road. The last thing the local residents will want is lots of people standing outside their houses and possible using their park for reasons other than it was intended. This would not sit well with the venue and any complaint against the venue can jeopardise the entertainments licence. With a bit of basic maths we now know how many we can queue and can plan for management of the customers when it looks like it will impact on the residential area. The next stage is to look outside the venue. 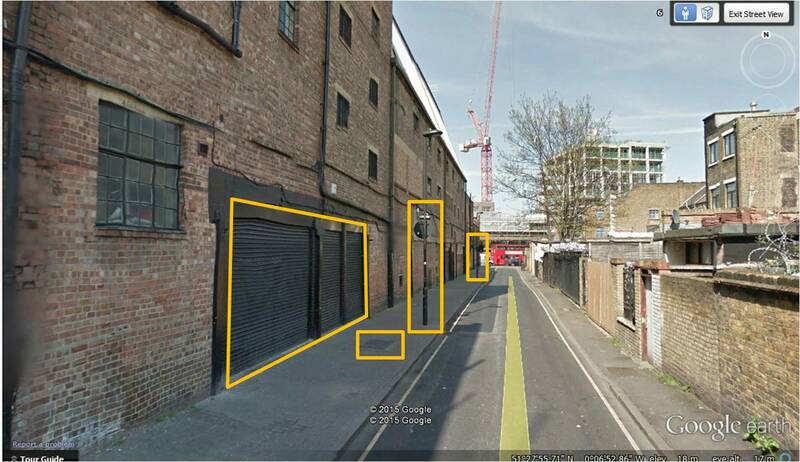 The following images show the outside of the venue on a normal day and can guide us in the correct direction of what we need to think about through the process. Again, points that we would consider looking at during the assessment have been highlighted. Red, are highest risk to the queuing system; Amber, lower risk but can impact on the queue. Yellow indicates the entrance to the venue. Lots of entrances to the buildings next to the one we are looking at. These all lead to occupied premises that we are potentially looking to queue customers in front of their door. 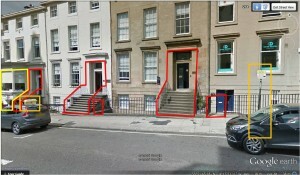 This is not going to build the best of relations with the neighbours, as any restriction of entry can affect trade. Is there any way around this problem? 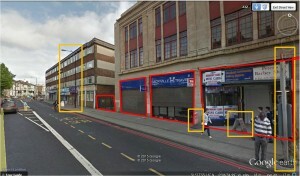 If we look at the buildings more closely they would appear to be places of business –shops. A couple of these are cafes/ restaurants. As we are looking at an urban environment, we could reliably predict that they will stay open later than retail places of business. This is due to the length of the rush hour in the city continuing later into the evening. The same can be said for the supermarket. We must consider there is the potential of rubbish collection, if the rubbish is not collected from the rear of the premises, then rubbish will be collected from the street. How this is deposited for collection would have to be observed, we can observe a couple of street bins outside the venue, but no others; this suggests disposable refuse sacks being used. 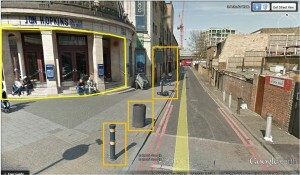 It is not unusual for there to be refuse bags deposited next to this type of bin for collection. Either option will impact on out queuing system. Deposits on the pathway will restrict the width on the path in some way and lessen the space for the general public to use when we have a queue. By assisting our neighbours with good housekeeping during the period of queuing we can ensure efficient use of the space available. 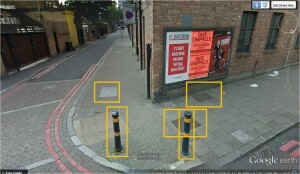 Possibly the most significant feature outside the venue is the pedestrian crossing, situated only a few meters West from the venues main door. Through observation of the heavy traffic outside the venue we can expect this crossing to be well used. 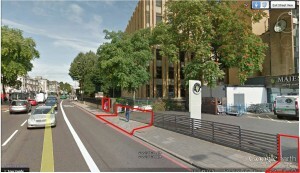 On the opposite side of the road is a large underground station, servicing the local area. In London, the underground serves as the transport for a high percentage of the population. The road outside the venue is exceptionally busy and we would see good use of this crossing. 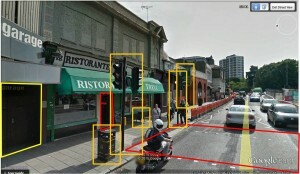 A build up of pedestrians will occur during peak hours as they wait for the signal change. For a short period of time there will be a restriction of the pathway at this point. 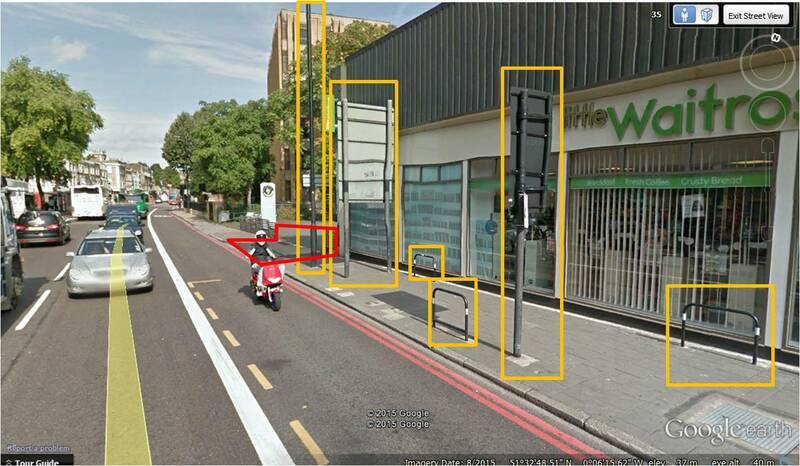 Additional street furniture can be observes, sign posts, signal lights, street lighting, bike stands and advertising boards. 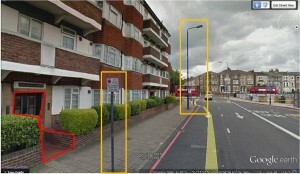 All of this restricts space on a pavement and becomes on obstacle that pedestrians have to navigate. 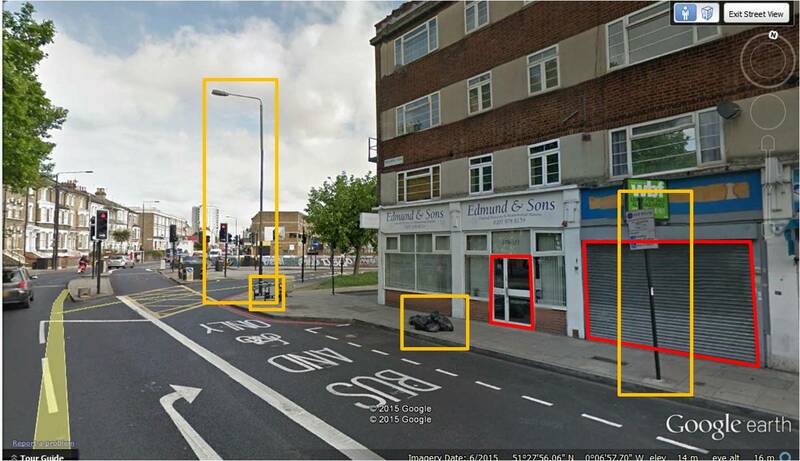 We should ensure that no street furniture impedes the route of our queue or through the placement of our queue should pedestrians have their passage restricted. When we looked at Option 2, there were many restrictions. As we look west, there are a lot of street fixtures and a major high street supermarket. 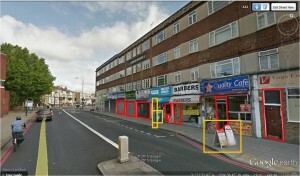 Outside of this are bike stands which potential customers to the supermarket would be looking to use. We then come across 2 vehicle entrances to a premise, set back from the main road to allow a car park in front of the shop. Although this is not part of the road, it is still entry points for vehicles. A rule we set was that we would not queue across roads, this would class as a road. As such the queuing of customers must stop at the first entrance. 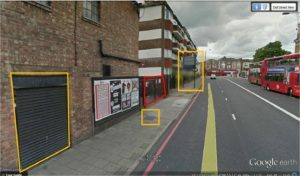 Although this popular venue has a medium size capacity than what its reputation might suggest, we can see that there is a potential for the customers to impact on the surrounding area. With this in mind a well thought our management plan of the exterior of the venue and queue management would be of benefit. This would have to include the introduction of stewarding/marshalling of the customers as they queue. With the understanding that we will have a queue outside the venue at some point and that it can be managed, we look to out with the physical constraints of the venue and area around it to see if there is anything that can help. London is a massive capital city that stretches over a vast area. 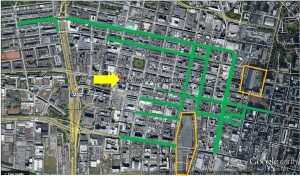 The venue is situated in an area out with the centre of the city. 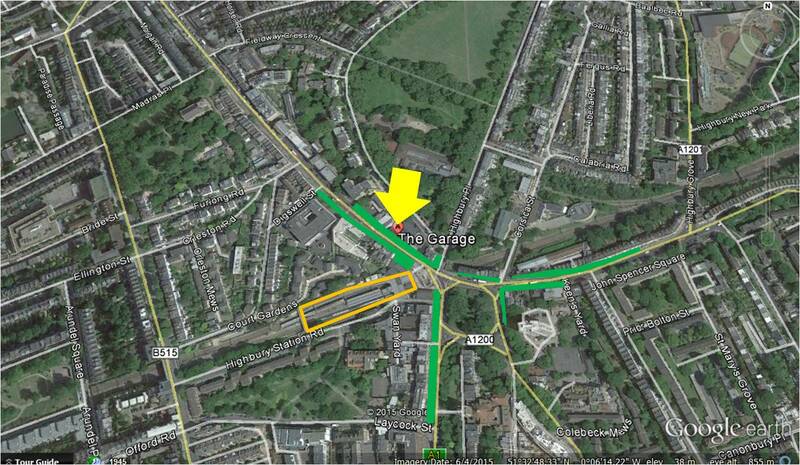 This indicates that the majority of the customers will be commuting to the venue. 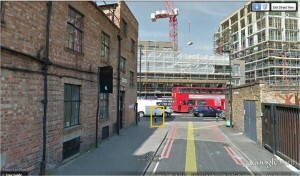 The venue advertises on their website that there is no parking at the venue and a quick check of the local area indicates that the residents utilise all the parking. 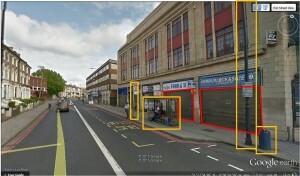 Situated across from a large underground station and several bus stops, the customers are urged to use public transport. 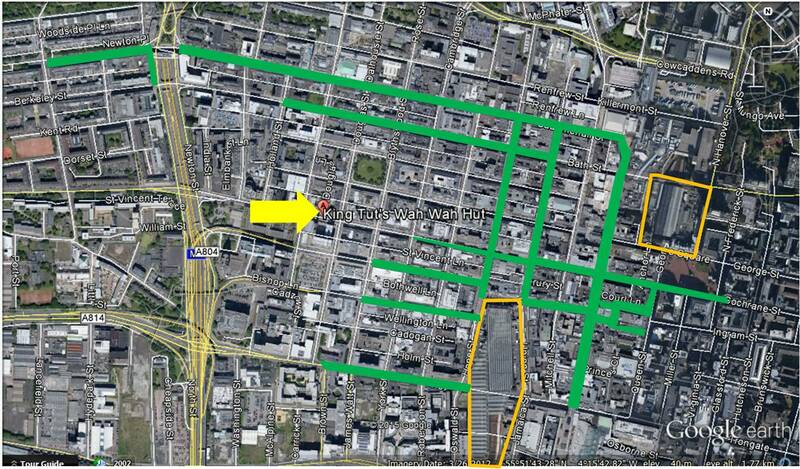 With the size of this transport network, it can take time for the customers to get to the venue. There is also prolonged rush hour within the city as commuters pass through the system. 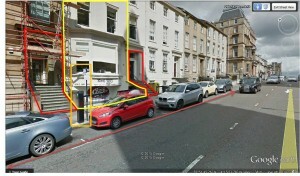 The venue has also provided a bar at the front of the building just next to the main door. This would allow early arrivals to use the bar to wait in till the venue opened; if they chose to do so. These factors help the venue and delay any build up in a potential queue. The use all public transport also creates a pulse effect, as customers arrive in waves as their mode of transport arrives close to the venue. 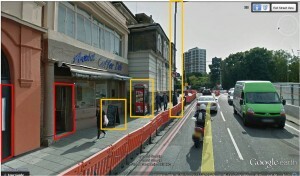 This could create smaller queues, dependent on the volume of customers arriving at the one time. By looking out with the venue itself, we see that the city is assisting us in reducing the potential for queuing. 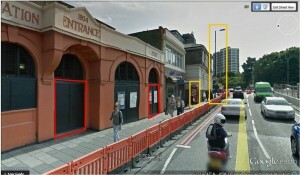 Now knowing the capacity of the venue and worse case is they are all queuing outside before they are allowed entry, we can start looking at our options of where to queue customers. With a bit of study, we have come up with 2 solutions and a bit of problem solving. = 420 persons can queue in the space. = 205 persons can queue in this space. So both options are short on space if we go with either option. Provided with this information we know that there is going to have to be human interaction with the customers that are queuing. We can initially monitor early arrivals and when then when the queue is getting to a sizable length, we can ask customers to compress the queue and move closer together. 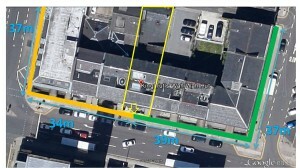 We know that we can safely double the persons per square meter to 4ppm2. This provides us with Option 1 queuing 840 persons and Option 2 queuing 410 persons . Option 1 provides us with the better option for queuing, but is still not sufficient to queue the capacity of the venue. This causes the venue a bit of a problem and one that needs resolved and reasoned. We will come back to this after we have looked at the queuing space external of the venue and its suitability. 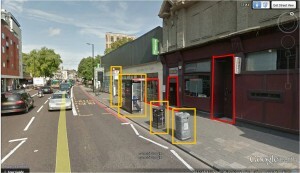 With residential areas being above the retail outlets, then rubbish will be collected from the street. 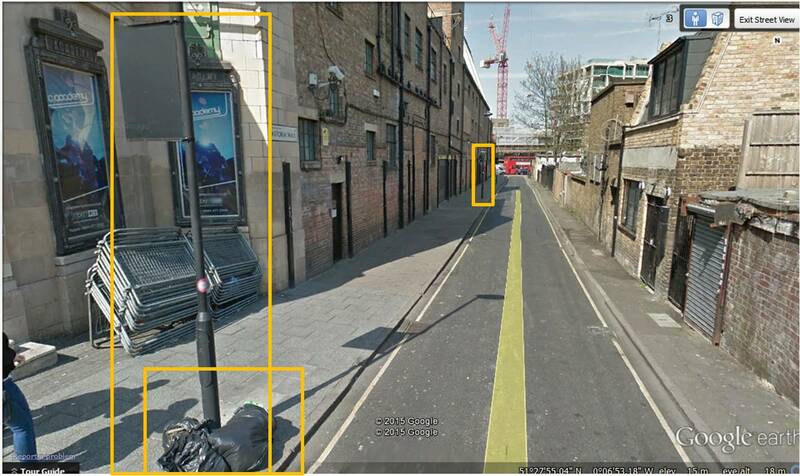 How this is deposited for collection would have to be observed, we can observe a couple of street bins outside the venue, but no others; this suggests disposable refuse sacks being used. It is not unusual for there to be refuse bags deposited on the street the night before collection or a variation of this based on collection time (it is unlikely this time will be during the day, due to a busy road network). 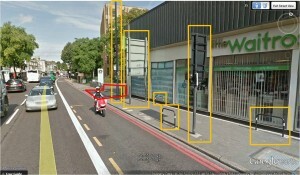 This will impact on out queuing system. Deposits on the pathway will restrict the width on the path in some way and lessen the space for the general public to use when we have a queue. By assisting our neighbours with good housekeeping during the period of queuing we can ensure efficient use of the space available. When looking at Option 2 there are a few points to pick up on. 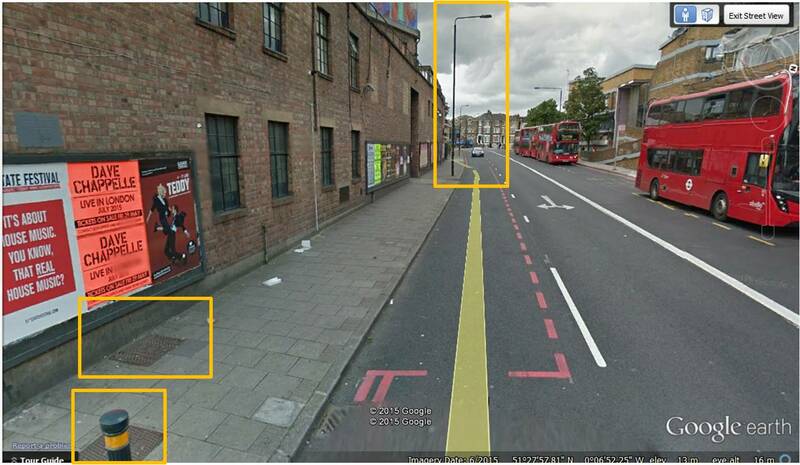 There is significantly less street furniture on this route for our queue to interact with. 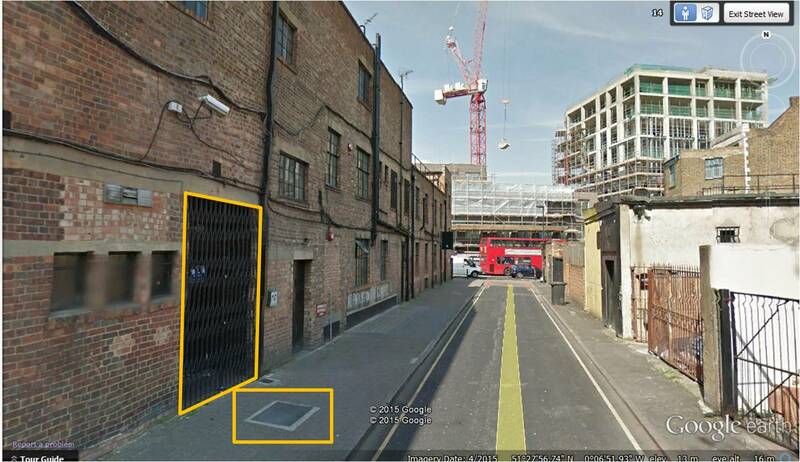 There a few manhole covers; which should be regularly checked to ensure that trip hazards are avoided. The lane to the east side of the venue which is used in Option 1 features a live road. 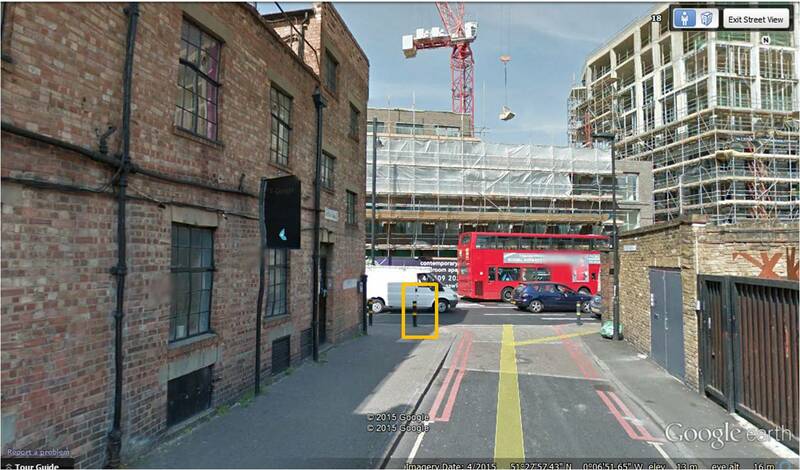 This one way road is entered from the rear of the venue. This road would appear to those that do not use the area to be more pedestrian in nature. As a live road though, measure would need to be put in place where customers do not stand on the road and that they do not block the pathway. It must be remembered that pathways should be available for pedestrians to use; unless you have permission to close the footpath and an alternative route implemented. 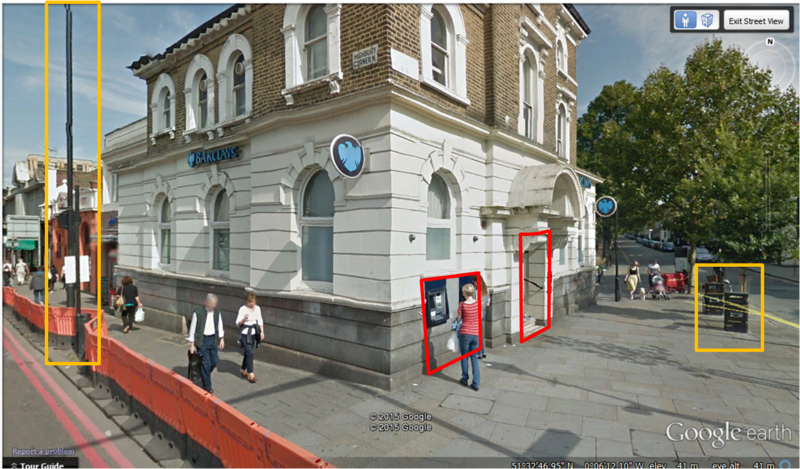 As Option 1 queues customers along the side of the venue we should note the shutters on the side of the venue. As previously mentioned we have no understanding of the venues crowd management or structure; although these look like fire exits. Consideration should be made as to how a queue of people exterior of the venue may impact on the fire safety precautions of the venue, if any. 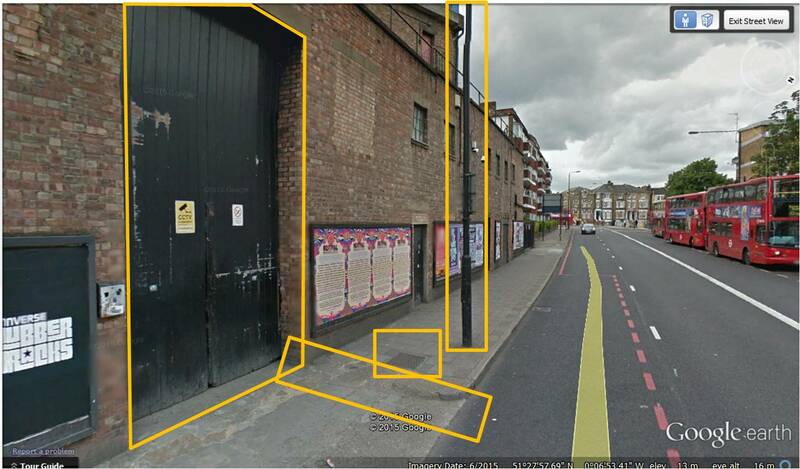 To the rear of the venue we will see that the suggested queuing area progresses past residential housing. To assist in the relationship with the local neighbourhood and business owners, monitoring and management of any queue would be advised. 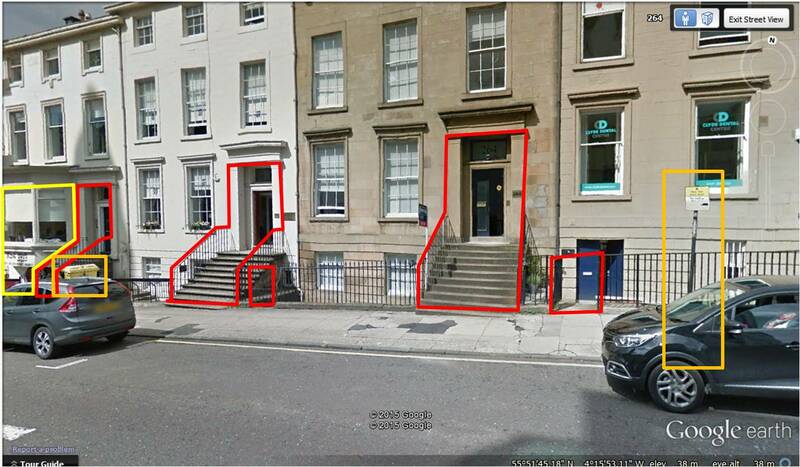 Ensuring doorways are not blocked and pathways allow pedestrian to come and go. 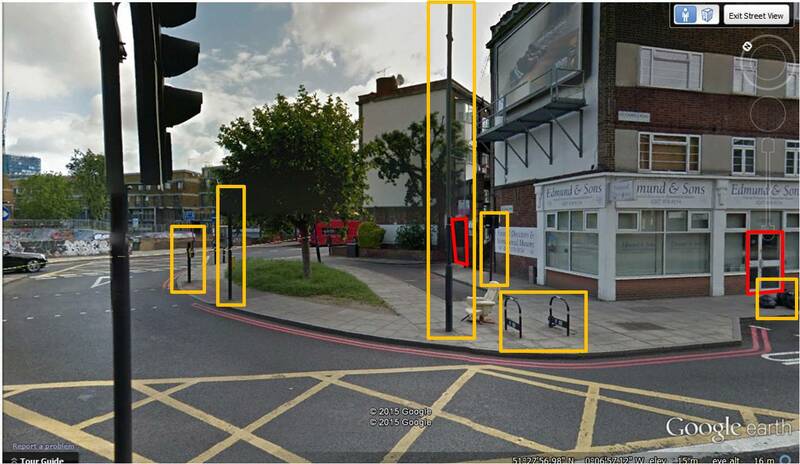 Additional street furniture can be observes, sign posts, signal lights, bus shelters, street lighting, bike stands and advertising boards. 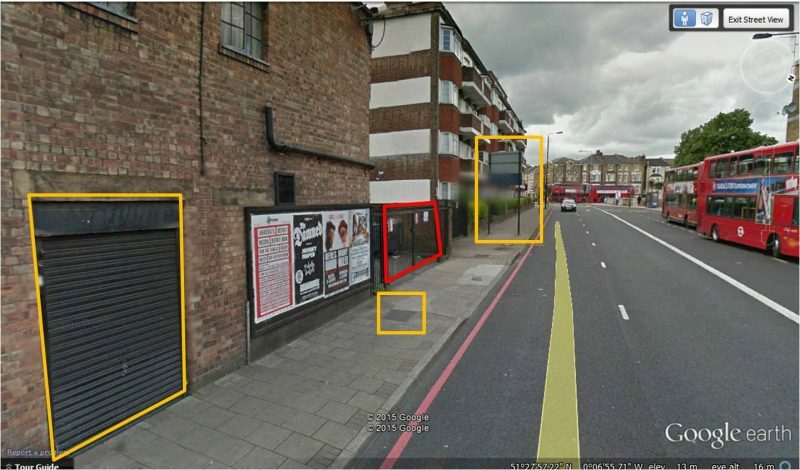 All of this restricts space on a pavement and becomes on obstacle that pedestrians have to navigate. 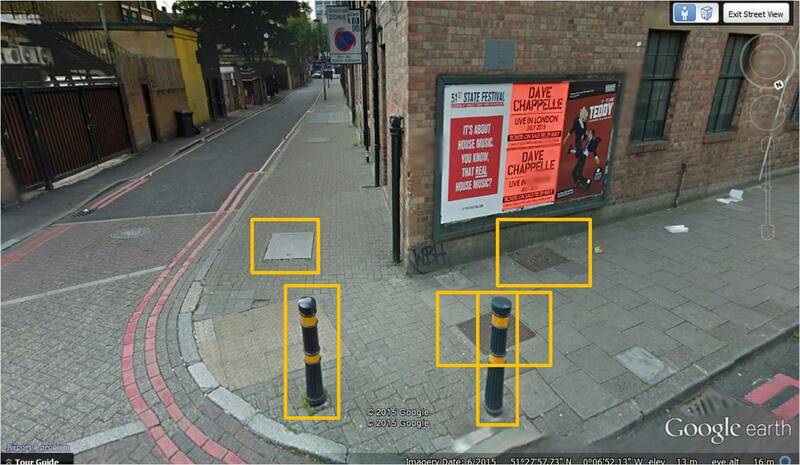 We should ensure that no street furniture impedes the route of our queue or through the placement of our queue should pedestrians have their passage restricted. When we looked at Option 2, there were many restrictions. As we look west, there are a lot of street fixtures and a bus shelter. 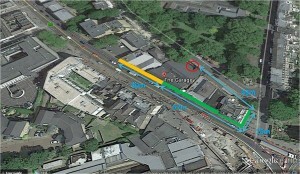 This will be busy at periods during the day and evening, restricting the available space in this direction. So after conducting a survey of the available queuing space we conclude that both options fail to achieve the desire to hold all the venue customers in a queuing system. Is there a possibility that we could use both options? The venue has a floor area and a balcony area, so we can separate the customers into according queues. As the floor area, especially for standing shows draws the higher percentage of customers arriving earlier (to get closer to the front), it would be advisable to use Option 1 to queue the standing customers. If the balcony has reserved seating there is less chance that customers will arrive early; they already know they have their spot reserved for them. Using Option 2 for this queue will lessen the chance of the queue impeding the retail premise. The combination of both allows for 1250 customers. As the evening progresses and the pedestrian traffic decreases after the rush hour, can we use another meters width of the pathways? 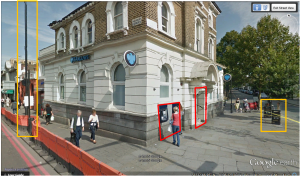 It is difficult to move people after they have started queuing, but could it be a solution? With the combination of both queues and the doubling of width, we are still a long way short from holding a capacity audience in a queuing system. 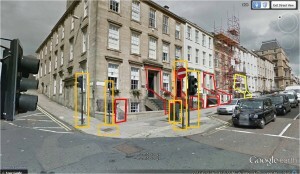 Once again we have to look at the greater environment of the location and environment. 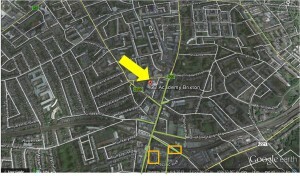 Located to the South of the River Thames, Brixton is out with the centre of London. 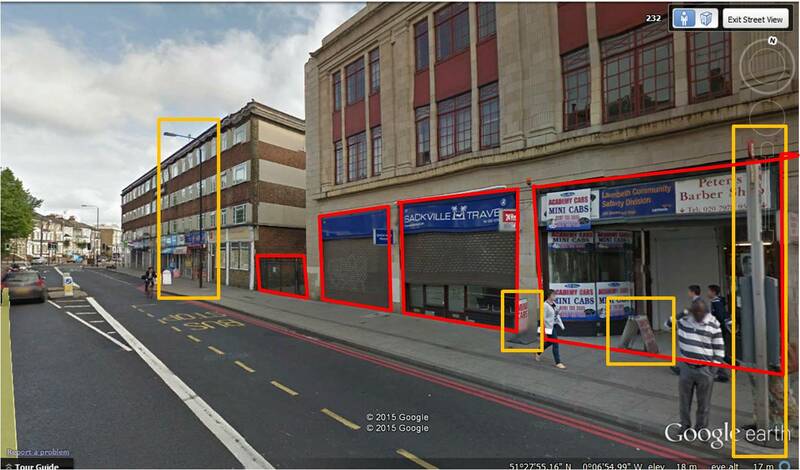 Situated a few streets away from the main shopping and entertainment areas within the local area the venue is slightly isolated from the surrounding area. Apart from a couple of restaurants there is nothing immediately around the venue to entertain customers when they arrive, this gives them no option but to queue. This can delay customers from arriving in the local area early. They may wish to enjoy the early part of their evening elsewhere before the commute to the venue. With the size of the city, commuting to the area can take a significant period of time and will delay the arrival of customers. This benefits the venue greatly, as it has nothing on offer externally and a queue is just a management problem that could cost money. It should not be underestimated that there will always be queues outside of music venues. Music has an emotional influence on people and emotions can make us do strange things; such as standing outside in the rain and snow for hours, just to allow us to get closer to the person that prompts these emotions. The amount of people that will do this varies dependant on the act and the age group they attracted. The older an audience is, the less likely they are going to queue for hours; we would rather socialise indoors than stand on the streets. When the audience is younger though, there is a greater chance that they will arrive early and queue. This is part of them socialising. They are either too young to go to bars or they may not have the money to afford this. There is also the excitement of music when you are younger, if plays a great part of youth culture and by extending the timeline of your day by being at the venue and interacting with other likeminded people. This can take management by the venue as with youth comes energy and over excitement and sometimes this needs controlled. We can see that with a bit of observation and thought, we can rationalise and plan for a systematic queue management solution for established venues within an urban environment. Some simple steps and calculations provide you with the facts that can assist you in planning ahead and providing an enhanced customer experience.